The domed ceiling of the Planetarium was originally black with stars painted on it, making it in some sense the nation’s oldest planetarium. 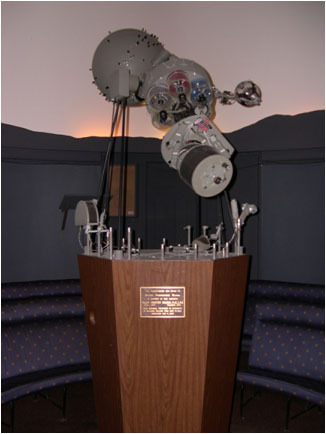 In 1963, a Spitz A3p projector was installed, named in memory of Prof. Willis Milham, professor of astronomy from 1901 to 1942 and the third director of the observatory. 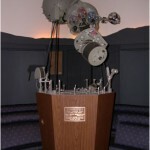 In 1973, the side rooms were turned into the Mehlin Museum of Astronomy in memory of Theodore Mehlin, fourth director of the planetarium and professor of astronomy at Williams from 1942 to 1971. 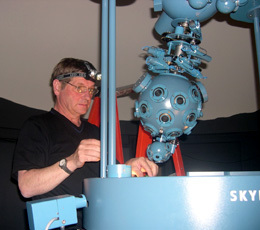 In 2005, a new projector, a magnificent Zeiss Skymaster ZKP3/B, was installed to replace the older projector. The change was supported by the President’s Fund from the Class of 1958. 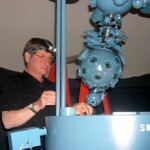 The Milham Planetarium is supported in part by the Brandi Fund.